Since I have now learned that May the 4th is Star Wars Day, the only appropriate bento for Mr. Ben was a Star Wars themed one. May the Fourth be with you! We already made Star Wars cookies to use, and I also made him a light saber this afternoon, so all is good in the boy's world. 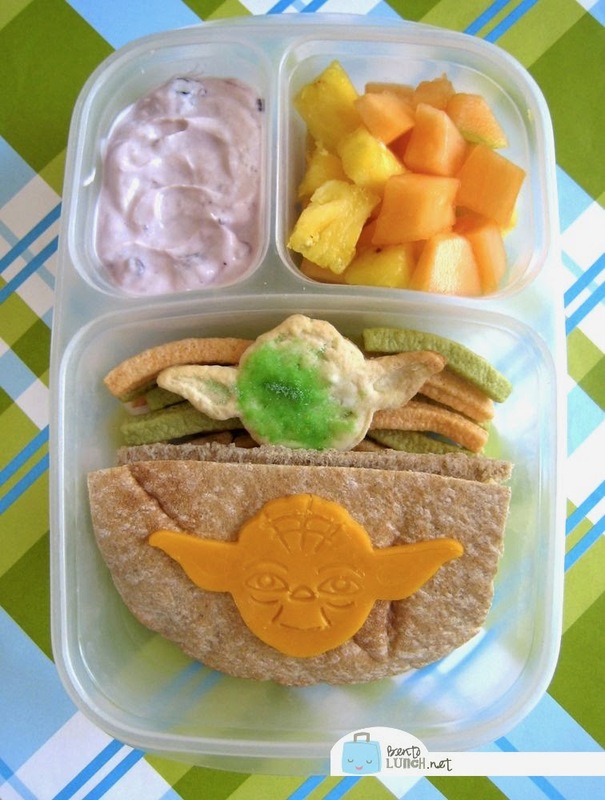 Ben has a roast beef and cheese sandwich in honey wheat pita halves, topped with a Yoda cheese. The cheese did not really take the face impression well, but not too bad. He has one of our Star Wars cookies too and some veggie straws. The smaller containers hold cantaloupe and pineapple, along with blueberry Greek yogurt. It's all packed in one of our Easy Lunchboxes, so that works well for yogurt. Oh, and if you're wondering why all the Yodas? The others don't have as distinctive a shape, so if the patterns don't impress correctly, it's pretty much an unidentifiable blob. Yoda it is! Yay for Yoda! I'm going to have to try the wrapping tube lightsaber with Kidlet....he's hooked on the idea of getting a Force FX one, maybe I can stave him off with making his own!